Today we are joined by Stephen Wadsworth, stage director for Seattle Opera's production of The Ring. SG: This is the third time you’ve directed this particular production of The Ring. How has it evolved from 2001 when it first premiered? In the current economic climate has it limited anything or brought about more creativity to use resources you have available? SW: This is a Ring based as much on the actors as on anything else, so it evolves very much through the actors. Some actors keep returning, so their portrayals deepen, and some actors are new (many this year), so they bring different perspectives and change into the room. These developments are always big, though they aren't as visible as a change in the scenery, say. There were some small things we wanted to change in the physical production this year, but "the current economic climate" did prevent them from happening, but they are so unimportant when compared with the growth actors can provide: the performers are the director's greatest resource. If you were to compare the staging of certain scenes with the same scenes in 2005, you would see something almost completely different this year. 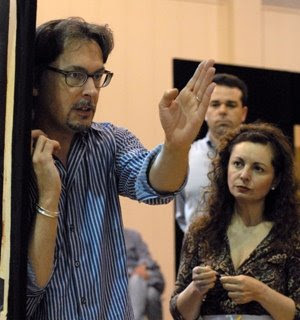 SG: The rehearsal process for The Ring is unlike anything else in opera and this year it started earlier than ever. What is a typical day like during rehearsal? For example, looking at today’s schedule, how do you switch gears from working on Walküre, Act 1 in the morning, Götterdämmerung, Act 2 after lunch and then working on Walküre, Act 2 and Siegfried, Act 3 simultaneously after the dinner break? Do you take notes, have assistants, etc? Do you find this quick transition difficult for cast members as they sometimes take on different roles in the different operas? SW: My day has three three-hour sessions, morning, afternoon and evening. We have three principal rehearsal rooms and a number of coaching rooms, and sometimes we are also rehearsing in an open hallway in the rehearsal building as well. We all have to jump back and forth among the four operas. I have two associate directors, Gina Lapinski and Tomer Zvulun, who are more than assistants---they take charge of certain scenes, usually scenes which the actors involved have done before, but not always. Sometimes they take over for a while after I have started a scene, sometimes they start the scene and pass it on to me. They are extremely interesting people and both artists of great sensitivity. I do worry sometimes that jumping back and forth among scenes might be confusing for the actors, but if someone needs to progress more in order, he or she tells me, and we try to make that happen. I also worry about my own ability to adapt: I recall that story about Sir Thomas Beecham showing up at the theater to conduct and saying, "What is it tonight? Aida? Meistersinger? The Bartered Bride?" SG: During the rehearsal process, do you have a unified vision for every moment of the action or do you like to see where it goes at any given moment and develop the drama in that fashion? SW: I always have a template for the scene, in terms of where characters move, and why and how, but it very rarely ends up happening as I've designed it, and that template is really more a way of studying the scene than it is a blueprint of how the scene will look. Obviously if we have done the scene previously with the same actors, they will remember it easily and do it in largely the same way, always with interesting variations. But when the people in the scene are new, things change, as noted above. One really interesting thing here is that some actors love to get a pattern in their feet, on their bodies, as soon as possible, and then work out how to own it, and some need to work it out as they go along. People's minds and hearts work at different rates and often in very different ways, and I have to allow for those differences, encourage them even. We all love when things come up in rehearsal and everything goes in a new direction---intention, feelings, blocking. Of course, sometimes it's wrong, and we have to fix it later. SG: You put such an emphasis on the textual meaning of the drama. When working with singers do you allow them to interpret the characters they’re playing? With this focus on the text do you find it challenging working with some singers who may not have been in productions where the acting and text was as strongly emphasized as in your production of The Ring, and if so how do you overcome this? SW: When you say text, do you mean the words, or the musical text? Text in opera means both words and music, so emphasizing textual meaning means studying both and talking about the relationship between them. This conversation is big in the rehearsal room. Often we refer to the words to guide us toward a clearer understanding of the moment, but often we refer to the music for that clarity. Interpretation is a tricky word. On the one hand I want not to be interpreting the piece, but doing what it IS; on the other hand, with a work rife with symbols and ambiguities, such as The Ring, there's really no saying what it IS, there is only interpretation. In any case, director and actors and conductor share the burden of interpretation: it's up to us to find a way to play the scene in which all parties can invest. I do think, yes, that the way I work is unusual in opera and that it surprises some singers who may not be used to being perceived as actors, but 99.9% of them seem to enjoy it. I'm very rigorous with certain elements of craft, and very watchful, and I ask a great deal of them, so I spend most of my time feeling extremely grateful for their indulgence with my peculiar ways. SG: Without giving away too many secrets, will the audience see any major changes to the staging from previous performances? SW: I don't think the audience will be aware of the differences, unless they really know this production. Perhaps they will feel more in certain scenes because of how we are doing them this time around, but you know, perhaps they will feel more, or less, because of where they have come in their lives since they last saw this Ring, or any Ring, or because of what they ate at dinner or because of the distressing phone call they had with a family member earlier in the day. There are so many variables that set people up for how they receive a performance in the theater. We try to make the work on the stage compelling and unfailingly human, so that they are drawn in regardless of where they have come from in their busy lives. SG: While I’m sure there isn’t much free time now, were there any books, plays, or other operas you were exploring in order to prepare for The Ring? SW: When people ask me what to read to get ready to experience the Ring, I say: Aeschylus' Oresteia, the three-play cycle about the House of Atreus which influenced Wagner so seminally in conceiving both form and content for The Ring. And I also say: Frederic Spotts' book on the history of Bayreuth, because Wagner and his family history are so arrestingly similar to Wotan and his family history. Of course there have been new chapters in that drama since the Spotts book came out, but the parallels are vivid and in a way very revealing of essences in The Ring. SG: This production has received quite a bit of critical praise, taking into consideration your other works, where would you rank this production in terms of enjoyment of working on and success of your vision of the production realized for the stage? SW: To have an opportunity to work on this masterpiece---long, exacting, ridiculously complex, ravishing and moving---is an honor. Even when the endless logistical difficulties cow me, I am mindful of this honor. And to have a chance to do it with a brilliant, enthusiastic producer like Speight is, well, unique. It's hard to imagine doing it anywhere else in the world and having so much care lavished on all aspects---except maybe Bayreuth. Add three of the greatest designers the American theater has produced, and a company of wonderful singing actors, and Seattle, a place very dear to my heart, and you have a lot of blessings on one project. Enjoyment? Well yes, profound enjoyment all the time, but also physical and emotional exhaustion. Doing The Ring is a little like having the ring itself: you're really in for it. This interview with Stephen Wadsworth should be "must-reading" for anyone seeing this years "Ring"; I hope, therefore, that it will be reprinted in the "Encore"-Programme!! Yes, Spotts' book is also valuable pre-performance reading! But, as Stephen says, it is not completely up-to-date, while a very recent book, "The Wagner Clan" IS up-to-date and very revealing, also, about the period Spotts also covers, so I'd say read Spottts and "The Wagner Clan"!! This interview makes me sad that my responsibilities in Schwerin (Germany) where I spend most of my time (8 months out of the year) make it impossible for me to attend this year's "Ring"; I stood for all three cycles in 2001 and 2005, as well as for the previous "solos" of "Rheingold" and "Walkuere" (standing for so "long" is NOT hard, as Stephen's staging was so gripping!! And standing is affordable for one, like me", who is very dependent on his Social Security electronic "checks"; Standing Room cost only $15 per ticket in 2005, but plan to get to McCaw or John St. four hours in advance of when they go on sale, as there are only 18 Standing Room places!!! Also, as Standing Room is at the back of the "Orchestra" seats in the auditorium, it is closest to the couches and chairs in the main lobby, so you can sit through the whole intermission (perhaps while reading the rest of Spotyts and/or "Wagner Clan" if you have not already done so! After making the above comment (recommending Spotts and "The Waggner Clan", it occured to me that there is also a very interesting "Ring"-staging in the works in Luebeck (north of Hamburg) Germany. This production ("Rheingold" and Walkuere" so far, and "Siegfried" this coming September) are all VERY "werktreu", but completely up-to-date (set in the first decade of the 21st century), as practically nothing occurs on stage that does not come from the words or (as Stephen stresses) the music!! Yes, the "Ring" is as relevant to today as it was to pre-historic Germany!! I'd say: see Stephen's staging of Wagner's "Ring" in Seattle and then go to Thomas Mann's home town of Luebeck and be admiringly amazed at how well Anthony Pilavachi set Wagner's "Ring" in today's world -- almost completely werktreu, something I insist on!!! Stephen Wadsworth rocks! :) Love his work at SO, and the Rep before that. The Iphigenia from a couple years ago was really amazing!